UPDATE: I would like to thank all who joined this successful Google + Hangout. I plan to report our topics of discussion in a subsequent post. 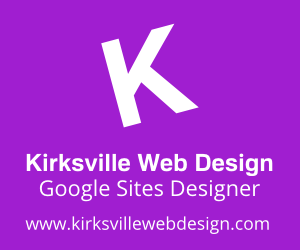 Join Kirksville Web Design right now for a Google + Hangout. I should've tuned in to listen to their Hangout. Could you include me in your mailing list whenever you'd have a Hangout? Thanks. Some podcast hosts even tried to used this service to broadcast their shows and it was a consensus- they like it. Even Felicia Day used it to promote her mini-series and received a lot of views. Thank you for giving us the link to the Google + Hangout. I'll listen in soon. This feature in Google+ is really awesome. YM don't even have this kind of thing and the fact that it runs on your browser is really cool. KWD stands for Keywords right? Google love well optimized websites and those that are doing white hat practices. I wish I could have attended the Google+ hangout. Is there a next one? Thank you for sharing the link, I'll be sure to keep this in mind.